Amid growing concern about food safety and the nation’s low food self-sufficiency ratio, agriculture has recently attracted a lot of attention in Japan. Here we would like to give an overview of the current situation of the nation’s food supply and agriculture, and outline some new trends and future prospects. The increasing interest in agriculture centers around three major issues: the low percentage of food self-sufficiency, the deterioration of farming communities, and food safety concerns. Japan’s food self-sufficiency ratio was 73 percent on a calorie basis 44 years ago in fiscal 1965, but it has continued to decline, reaching 40 percent in fiscal 2008. This is the lowest figure for an industrialized country; for example, the ratio for the United States is 128 percent, for France 122 percent, for Germany 84 percent, and for the United Kingdom 70 percent. Since the end of World War II (in 1945), Japanese people have been consuming less rice, which is largely supplied by domestic production, and eating more livestock products, oil, and fat, most of which are imported. This trend is considered the major reason for the large decrease in Japan’s food self-sufficiency ratio. On the other hand, international grain prices reached record highs in the first half of 2008. Without any significant change in structural factors, such as an increase in world population, international food supply and demand are projected to continue to be volatile, posing a high risk to countries that rely on imported food. Another serious issue is the deterioration of farming communities in Japan, as illustrated by an increase in abandoned or idle farmland, an aging workforce, a severe shortage of new workers and other factors. These problems could lead to the collapse of the nation’s food production base. Japan’s total area of abandoned farmland remained unchanged until 1985, standing at about 130,000 hectares. It then started increasing, and reached about 386,000 hectares in 2005. According to the 2005 Census of Agriculture and Forestry by the Ministry of Agriculture, Forestry and Fisheries, 37.8 percent of self-employed farmers and 58.2 percent of people mostly engaged in agriculture were aged 65 or older. The Agricultural Land Act of 1952 is based on the idea that farmland should be owned by its cultivator. In line with this “independent farmers” principle, this law has facilitated the acquisition of farmland by cultivators, while in principle prohibiting corporations from acquiring it. This land reform contributed to the democratization of agricultural communities in Japan after the war, but also brought about a situation characteristic of Japan, in which farmland is divided into small, scattered and disconnected fields. In response to this situation, which is considered serious enough to undermine the basis for Japan’s food production system, the government has started easing regulations to allow companies to enter the agricultural industry. This deregulation effort aims to make it easier to sell or lease farmland, expand the scale of farming, and ensure that a variety of entities will be involved in agriculture. This legal change is backed by the increasing demands of consumers for safer food in the wake of a number of recent incidents of threatened food safety. We would now like to introduce some of the initiatives of the Seven Farm Tomisato, an agricultural production corporation that is engaging in agriculture from a unique perspective, established by Seven & i Holdings Co., a major retail group. Seven & i Holdings Co. is a leading retail group that holds several major companies as its affiliates, including convenience store chains, supermarkets, and department stores. In August, 2008, it established its first agricultural production corporation, Seven Farm Tomisato, in Tomisato City, Chiba Prefecture, in collaboration with Japan Agricultural Cooperatives (JA) Tomisato. In its roughly two-hectare field, it grows various vegetables, such as daikon radish, broccoli and carrots. In its initial fiscal year, the farm targeted an annual yield of about 130 tons with two rounds of planting. One of the distinct features of the farm is its recycling-based agriculture practices aimed at achieving a closed recycling loop. The farm uses food waste generated by local Ito-Yokado stores in Chiba, Ito-Yokado being the group’s affiliated supermarket chain, to make compost to mix into the farm’s soil. Vegetables produced by the farm are in turn sold in Ito-Yokado stores in Chiba. This kind of information provided by Ito-Yokado is effectively used in the farm’s daily efforts to grow safe, reliable produce that meets customer needs. The farm also works to avoid wasting any produce. Fresh produce that is irregular in size and shape is used for prepared meals sold at the group’s convenience stores or at restaurants. In spring 2009, the farm revealed plans to expand its land to four hectares to grow a wider variety of products for a greater number of stores. Supported by ongoing dialogue with local farmers, Seven Farm Tomisato has the potential to grow as a group farming business deeply rooted in Tomisato City. Some companies in the restaurant industry are proactively getting involved in the farming business. Watami Co., a leading restaurant chain, runs an agricultural production corporation named Watami Farm, aiming to provide a stable supply of organic vegetables to affiliated restaurants by producing them in relay at eight affiliated farms across Japan. Mos Food Services, Inc. collaborates with a Gunma-based farming company named Yasai Club (literally ‘vegetable club’) to provide a constant supply of tomatoes to Mos Burger hamburger chain stores. Corporations were permitted to undertake agriculture in designated structural reform districts in FY 2003, and they have been permitted to do so anywhere in Japan since September 2005. Corporations can pursue agriculture either by establishing new agricultural production corporations or investing in existing corporations, or by leasing farmland from municipalities or agricultural cooperatives to be worked by company employees; this latter method is called the Farmland Lease System. There were over 10,000 agricultural production corporations in Japan as of January 2008. To obtain farmland ownership, corporations have to fulfill certain requirements. For instance, more than three fourths of corporate staff must be farmers and a majority of the board must be full-time agricultural workers. This makes it somewhat difficult for non-agricultural companies to enter into agriculture. There were also some problems with the Farmland Lease System, which was officially initiated in 2005: because about 60 percent of the farmland leased was derelict land, with poor soil and resistant to restoration. Also, because available fields were scattered, it was difficult to secure large-scale fields. Even though the Ministry of Agriculture, Forestry and Fisheries stated its objective to involve 500 farming companies in the program by 2010, only 281 companies from 135 municipalities were actually carrying out agriculture as of March 2008, showing little progress in this area. To break this stalemate, a bill to revise the Agricultural Land Act that focused on liberalizing the leasing of farmland, was passed in the Lower House plenary session on May 8, 2009. This bill eases restrictions on leasing farmland, opening up opportunities for various types of organizations, including ordinary businesses, to enter into agriculture. At the same time, it strengthens provisions regulating the conversion of farmland to other uses in order to stop the decrease in farmland area. The bill also includes provisions for launching projects to promote the effective use of farmland. 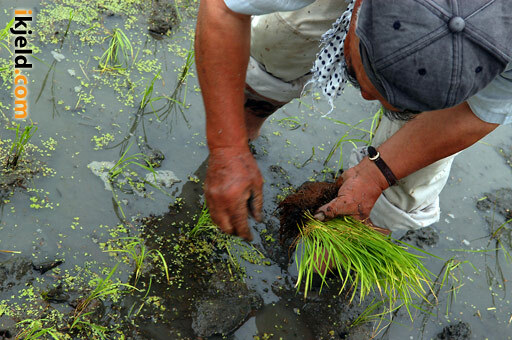 Will it be possible to revitalize Japanese agriculture and food supplies? In a context of international discussions about the possibility that energy shortages, global warming and the lack of water may in turn cause food shortages, agriculture is now attracting more and more attention in Japan. First published in May 2009 by Japan for Sustainability. Many thanks to JFS for their kind permission to reprint the article at iKjeld.com. I am seeking for information about Japan national bird which produce heathy eggs for consumers. I went at many sides but no result. Can you PLEASE find for me address or mail or Website for some farms which has this birds. There are many kinds in Europe but original bload from Japan desapired and its not original bird any more. I have had small farm some years ago and now when crize is on top I lost my job.I want to have farm again , but this time with original version with great respect to this small bird which gives lot of fun.